Not much to say, and since I just proclaimed that I wasn't leaving town anytime soon, my DH decides to make a liar out of me. Headed out of town this weekend. Have several stitching irons in the fire, this is just one. A kit from AS&E. Man do I miss my seamless pleating. Working over the seams has been a bear. I wanted to preconstruct this bishop but since I was going to have to stitch over the visible seams, I couldn't put the neck band on until it was smocked. Rats! Hope you are going some place fun! Enjoy!! 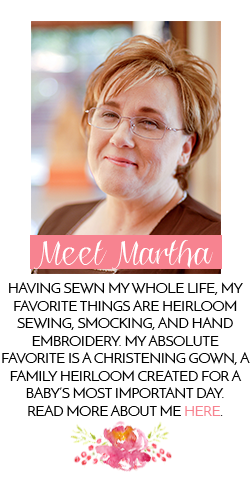 Always lovely Martha!! Enjoy the trip or are you enjoying time alone at home?? which ASE is that?? Soooo pretty! 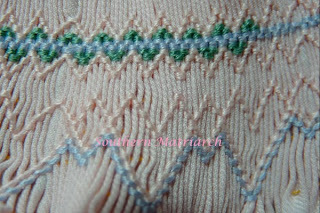 I need to go back to find your tutorial on seamless smocking. I'm thinking about making a bishop style dress for one of my grands for Christmas.